This study, announced today and published in the Journal of Cognitive Neuroscience, indicates the brain reacts to mistakes before information even gets processed consciously. The scientists call it an “early warning signal” from a lower region of the brain. Fascinating. Simple good / bad, normal / abnormal, go / no-go visual cues are processed much faster than long stories by managers about what should be happening or what they are doing to fix problems. Toyota realized some time ago that it is best to simplify the story and put it on an A3 so that the lower regions of our brain can handle the story automatically without getting distracted by all of that conscious thought. That may be a stretch, but my teachers of the Toyota Production System often talked about it being like “the autonomous nervous system” which reacts to information without conscious thought. The kanban system is one example of this, and the function of jidoka to detect errors and stop is another example. The entire goal of 5S is to enable visual management, the identification of abnormality and waste, once you have established what is “normal” and productive workplace organization. 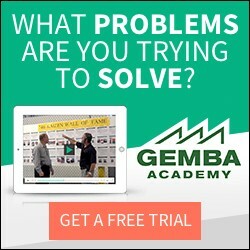 The discipline of visual management, and the habit of Lean leaders of going to gemba to observe what is happening on the gemba lets you quickly detect even small problems and fix them before they get to be big problems. It’s just letting your brain do what it does well, without letting so-called higher cognitive functions get in the way. It’s not the same as going to the gemba, but when you don’t have a gemba (as, for example, in the case of a sheriff’s department tracking lost hikers), these boards make the invisible, visible.